Zojirushi has been manufacturing rice cookers since the '80s, and is known as a leader in the field of commercial and home rice preparation. 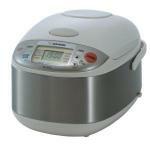 With this model, you have a simplified method of producing a large quantity of white or brown rice consistently. The Zojirushi 10-cup model is a large capacity rice maker for families who eat rice regularly or homes where parties or gatherings require a big batch. Smaller families can use the pot to prepare several days' worth of rice for meals throughout the week. I'll just admit it. I am a gadget geek. The thought of spending well over a hundred dollars on a device for boiling water doesn't phase me. As long as there is some major technology involved, it's Zojirushi to the rescue! I have never associated Korea with fine coffee but when I heard that Zojirushi made a coffee maker I was sold. ("You had me at Zojirushi.") It's one of the few brands that mean anything to me. I adore their rice cooker. 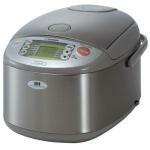 This rice cooker is a busy working cook's best friend. Ditto for the healthy cook. I eat twice as much rice now that I have a rice cooker. And I probably cook more at home in general, too. This little cooker just makes it so easy and convenient. I don't know about you, but I'm not looking for fuzzy rice. Fluffy, yes. Fuzzy, no. Forget those little brown lunch bags. Bring some culture to your lunch with Zojirushi Bento Lunch Jar. Bento is defined as a single-portion takeout or home-packed meal common in Japanese cuisine. What a cool idea: a mini breadmaker that creates adorable little 1-pound loaves. That's the perfect size for my family. I'm always buying larger loaves that end up moldy or in my freezer, where I always forget about them. I'm an old-fashioned girl who likes to use tried-and-true old-fashioned methods. No need for fancy ingredient-specific cooking implements, thank you very much. Cooking rice? Give me a pot, water, and a generous shake of salt. That's all I need.